1. Boil water. Add approximately 1 tablespoon of salt per quart of water. 2. Heat pan. Add canola oil. Add ground lamb in small chunks making sure to provide space in between meat to ensure proper browning. 3. After meat is caramelized add white onion and cook for 3-4 minutes, until translucent. Add garlic and stir into mixture, ensuring not caramelized. 4. Add stock and canned tomatoes. Bring mixture to boil and reduce to simmer, approx 8-10 minutes. 6. Add the oregano, cinnamon, and clove to the sauce, stirring until incorporated well. 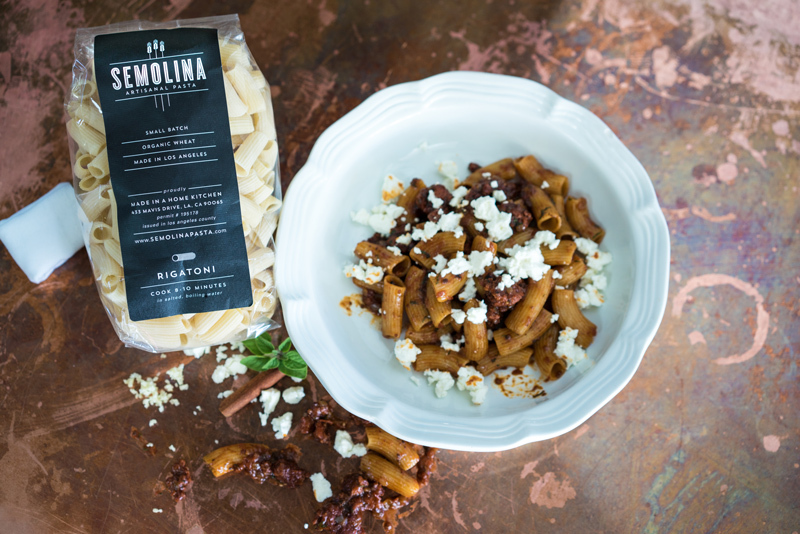 Place pasta in bowl of choice and garnish with crumbled Greek feta cheese. Drizzle with finishing olive oil and salt to taste.